Enjoy going out for dinner but bored with all the restaurants in your area? Even with different decor, most dining establishments can get repetitive with how they look. We want going out for food to be an experience worth remembering, but so many restaurants have lost sight of that. Until now, at least. If you’re not local to Arizona, you might want to invest in a plane ticket, because they’ve opened one of the most exciting restaurants to launch in years. Ever wanted to eat your dinner 21 stories below the surface of the Earth? Arizona is already famed for its Grand Canyon, one of the biggest landmarks in the United States. The site attracts more than six million people a year, but some of those people might now be making their way over to Grand Canyon Caverns. Located 2 hours away from the national park by car, the Caverns has recently become host to a new and incredibly unique dining experience. The Caverns Grotto is located 200 feet underground in the Grand Canyon Caverns, which has already been well established as a spot for sightseeing. Regular tours run through this area, but now you can take in the views while you dine on some great, authentic food too. Set in one of the biggest rooms in the cave, the restaurant sits atop a wooden platform that offers 360-degree views of the Caverns’ breathtaking interior. It’s not often you get to enjoy some sightseeing with your meal. 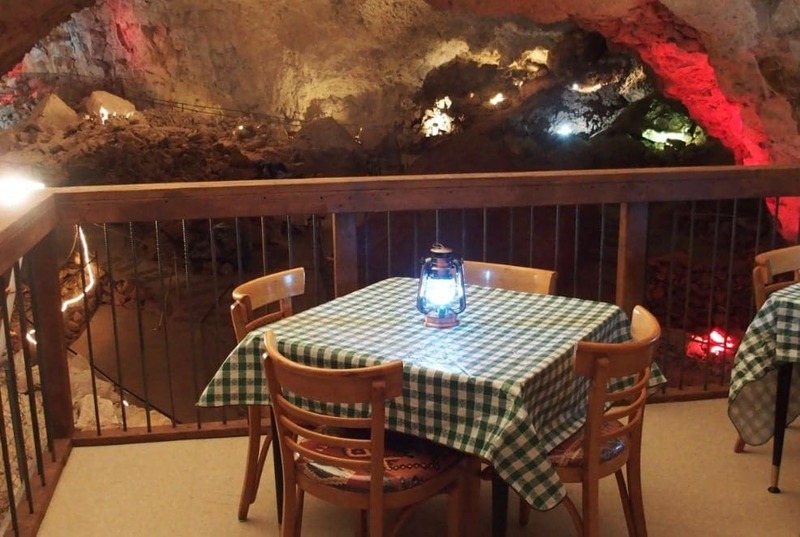 You’d certainly be hard-pressed to find a dining experience that can match the one at Caverns Grotto. The “classic American comfort food” at the restaurant is served through a pulley system leading up to the surface. Buckets are filled with the food which, once cooked, are lowered down to the diners. Applying electronics 200 feet underground isn’t exactly easy, and it would cause damage to the Caverns, so it’s easier if they cook everything up above. The chefs won’t have to worry about having too much work on their hands, because the restaurant can only cater to a select few people at a time. The dining space underground isn’t huge, and as such, there are just four tables on the deck. It means bagging a reservation might take a bit of time, but the wait will be worthwhile. Wouldn’t you rather it be quieter down in the Caverns so you can savor the peace and beauty of the caves more? As you might expect, a meal down in the Caverns doesn’t come cheap, but it’s more reasonable than you might expect. Per person, lunch at the restaurant costs $49.95, while dinner is an extra $20 more. These prices do include a tour of the cave, which would usually cost you $22, and the dinner menu is an all-you-can-eat buffet. That’s not bad going for a meal which won’t be like anything you’ve ever experienced before. Owner John McEnulty said the inspiration behind the establishment came after he visited the Blue Bayou Restaurant in Disneyland. He was blown away by how realistic the setting was, and it struck him that he could offer the public an even more authentic dining experience. 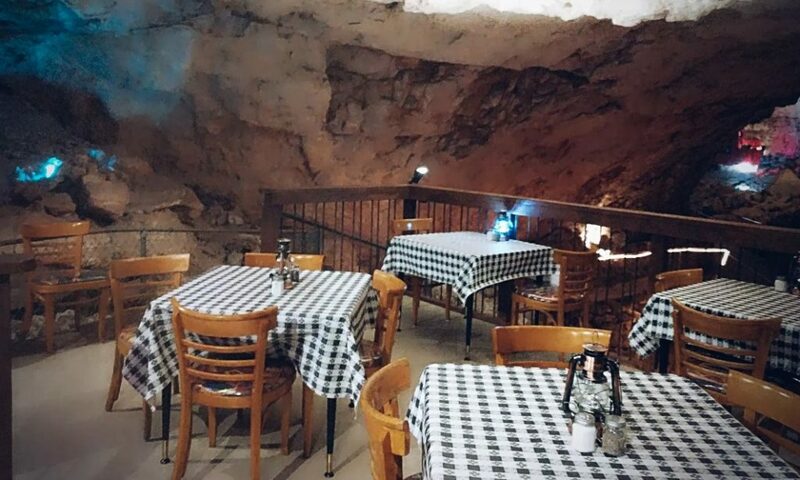 It quickly became apparent that he had the perfect space for the restaurant within the Caverns. Being close to the elevator but away from the tour routes, it’s the optimum location for enjoying a meal several hundred feet underground. If this sounds like an unmissable experience to you, you’d best reserve a table while there are still spaces available.